New Haven, MO: Fire Fest Living History. « The Turner Brigade--Missouri Volunteers, U.S.
« Kansas City, MO: Battle of Westport Reenactment. New Haven, MO: Fire Fest Living History. 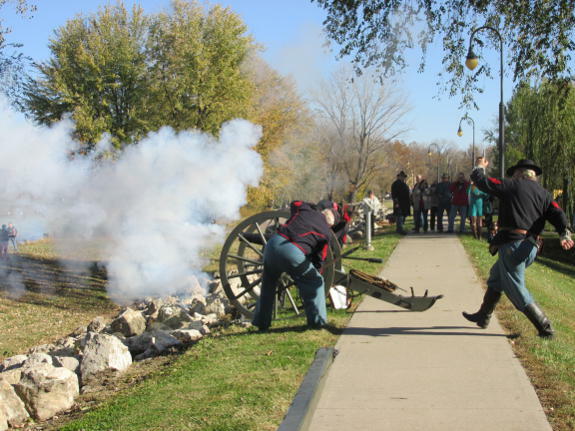 Members of Company M participated in a living history as part of the annual Fire Fest celebration in New Haven, MO, on November 1, 2014. Sgt. Charlie Tullock fires the Woodruff gun on the New Haven, MO, riverfront during the 2014 Fire Fest event.